For more than 25 years, Mackie has dedicated itself to empowering musicians and engineers through technology. Mackie's history is full of groundbreaking gear that has enabled the working musician to create and perform, delivering professional results at affordable prices. From our creation of the CR-1604, the first compact mixer, to our best-selling portable loudspeakers like the SRM450, Mackie gear is everywhere. Now, with products like the DL32R Digital Mixer and its companion Master Fader iPad app, Mackie is leading through innovation, creating cutting-edge designs that are powerful, but extremely intuitive. 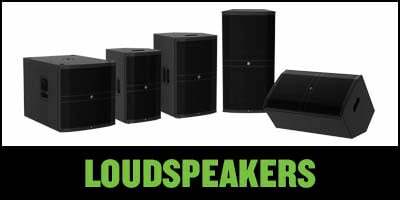 A leader in loudspeaker and mixer design, Mackie has solutions for any level of performance and any budget. Mackie: The Man. The Marketing. The Mixers. But before there was LOUD Technologies, before there was Mackie Designs, before there was TAPCO, there was the man who got the ball rolling, and who lent his name to the brand that carries his ideas and ideals forward – Greg Clark Mackie. As with so many iconic industry champions, the Greg Mackie saga begins with a love of music. Born in Seattle, Washington, Greg Mackie was raised some 25 miles north in the Puget Sound town of Mukilteo. He played drums in a cover band, back when amplifiers were rare and prohibitively expensive; the amps needed to be rented for every gig. As the son of a ham radio operator, Greg Mackie was exposed early on to the scores of electronic parts around the house, and to the piles of electronic parts catalogs. After dissecting one of the rental amps and comparing parts from those catalogs, Greg Mackie was convinced he could make a higher-performing product – and that he could make it for less money. After graduating from high school and a few years spent at Boeing, Greg Mackie teamed up with Martin Schneider to create TAPCO [Technical Audio Products COmpany] in 1971. Rock music was exploding across America. Tapco began by making the “better” electric guitar amplifiers Greg Mackie had originally envisioned; but it was solving the issues that rock bands were having with existing PA components that truly put Tapco on the map. Rock bands sang loud and played even louder. The mixers of the day could too easily overload, and the resulting distortion vexed many systems. Greg Mackie and Roger Rosenbaum created a single-knob solution called the AutoPad circuit that could effectively control the input preamp gain and the channel level all at the same time. This allowed the mixer to accept a much higher signal level without introducing any distortion. Equipped with this AutoPad circuitry, the Tapco 6000 became the must-have mixer of the day. The Tapco line expanded with the 6000R (adding reverb), the 6200 models (adding stereo) and the specialized Keyboard Mixer, which allowed the first generation of multi-keyboardists to get the best response from each instrument – be it the line out of the Arp Odyssey, the pre-amp output of a [Fender] Rhodes piano, or the Hi-Z pickups of a Clavinet. Tapco brought a new aesthetic to the mixer world. Their mixers were built road-tough and offered rack-mount capabilities. They looked good, they sounded great, and bands loved ‘em. The original Tapco was bought by Electro-Voice in 1979, and Greg Mackie went on to found Audio Control, a company making mainly hi-fidelity equalizers and analyzers, as well as products for the car audio market. Modular Digital Multitrack recording was the next advancement for the project studio. The Alesis ADAT and Tascam D88 led the charge. Each of these modular units could record eight tracks of digital audio, and multiple units could be linked together to create 16-, 24-, and 32-track studios for the individual producer, composer, musician, band, studio, etc. And once again, Mackie Designs was ready to meet the changing needs and challenges of an MDM studio. The modular nature of these recorders meant that, for the most part, all that was needed was an eight-buss mixing board. In 1993, Mackie Designs released three models of their first eight-buss analog mixer – the 32.8; the 24.8 and the 16.8. The timing could not have been better. Sales of MDM recorders and Mackie Designs eight-buss mixers fed off each other, quickly reaching a fever pitch. By 1995, Mackie Designs had its eyes on the live sound reinforcement market as well. Early that year, the SR 32.4 and SR 24.4 live sound 4-buss mixers were released to wild approval. Lessons learned in creating the Mackie Designs studio mixers proved invaluable in the creation of the live sound models. Mackie Designs mixers had a reputation for being “built like a tank” and being able to withstand the demanding environments of life on the road. In addition, the Mackie Designs philosophy mandated a mixer design that looked good, felt good to work on, and was easy to use. “The cornerstones of the Mackie brand’s success are generally from following one of two paths,” according to Matt Redmon, “either by making professional technology platforms available at more affordable price points (like the aforementioned ‘early years’ products), and/or solving real-world user needs with innovative, first-to-market solutions.” Later that year, Mackie Designs delivered its 100,000th mixer, and moved into their new 89,000 square-foot production center populated by state-of-the-art manufacturing machines. After years of success, Mackie Designs now found themselves in the crosshairs of every current and has-been rival. In addition, successful staffing these expanded facilities would prove challenging. Mackie Designs needed to step to the next level. In August of 1995, Mackie Designs took itself public with a Wall Street IPO debut. Mackie Designs brought numerous contracted production chores in house, adding an additional 81,000 square-foot facility to contain metal fabrication, screen-printing, and even a training center. Mackie Designs closed 1995 with a staggering total of nearly $64 million in sales. In the wake of their IPO, Mackie Designs arrived at the NAMM Show in 1996 with a select group of new products that would allow the company to expand into new markets. First was the M-1200 premium power amplifier. Developed originally as the platform for a line of upcoming powered mixers, the M-1200 was well-suited for installed applications such as studio monitoring and cinema playback, as well as for use by DJs and other performers. Next up was a line of active studio reference monitoring speakers, including the popular HR824 model. With the proliferation of Mackie Designs mixers in home, professional, and project studios around the globe, the Mackie monitors seemed a natural fit. Finally, new high-end professional mixers were introduced – the SR 40.8 and the SR 56.8. These mixers were the cream of the crop for Mackie Designs, containing their best circuitry, concepts, and components. These mixers reaffirmed The company’s commitment to the mixer market, even in the face of product introductions into new categories. Also in 1996, Mackie Designs introduced the UltraMix, a software-controlled automated mixing system, priced at well under $3000. The next step for Mackie Designs needed to be a complete digital mixer. In order make that leap, Mackie Designs teamed up with DigiDesign, then the creator of the popular Pro Tools DAW system to create the HUI (pronounced Huey) or Human User Interface protocols. This system would define a number of physical controller gestures (twisting knobs, moving sliders, pressing transport controls buttons, etc.) and map them to the built-in digital controls of the Pro Tools system; these protocols were adopted by many of the hardware and software manufacturers operating at the time. This partnership led to the creation of the Mackie Designs HUI hardware controller – and later to the streamlined Mackie Designs Baby HUI. The lessons learned in creating the Mackie Designs HUI were put to use in the first fully-digital mixer from Mackie Designs, the D8B, released in 1998 to rave reviews. Matt Redmon of Mackie offered his thoughts the type of collaboration that made HUI happen, “The advent of HUI, Logic Control, and the Mackie Control protocols – and their compatibility with nearly every DAW on the market – certainly elevated the collaborative brands [Mackie and each DAW provider] into a place that benefited a massive user base, with Mackie being the common element. Cal Perkins joined up with Mackie Designs on a full-time basis in 1996. Cal already had a distinguished career with JBL when he had interviewed with Greg Mackie at Tapco. At the time, Perkins didn’t want to leave Portland, and continued his career at Biamp, Ramsa, and then returned to JBL/UREI. Greg and Cal had stayed close, and Cal had contributed to the design of the mic preamps and the EQ on some of the early Mackie Designs mixer models. Once onboard at Mackie Designs, Cal was instrumental in creating the VLZ Series mixers. VLZ was his shorthand for Very Low Capacitance. By reducing a number of factors in the circuit design, the mixer could be made to produce less noise artifacts and to provide a cleaner signal with less distortion. The VLZ design not only kept the mixer quiet, it also minimized noise from external sources – of which there are plenty on a concert stage or a recording studio. Even to this day, premium Mackie mixers feature the “Perkins” design British EQ. Perkins had a hand in the design of Mackie Designs active studio monitors and live sound reinforcement loudspeakers as well. 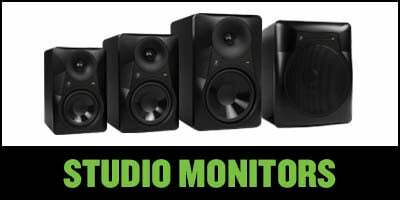 The decision to go with active (self-powered) monitor speakers was made to increase the number of complementary speaker and amplifier technologies that could combine to optimize the final performance, as well as to protect the speakers from improper usage. In addition to bringing on Cal Perkins to help with Mackie Designs speaker designs, in 1998 the company also acquired Fussion Audio and RCF (Radio Cine Forniture), a full-line Italian speaker company making everything from finished systems to individual drivers and transducers. This influx of engineering talent and manufacturing know-how immediately influenced the creation of the Mackie Designs SR Series of powered loudspeakers, which effectively doubled the size of the company. Mackie Designs had become a major player in live sound reinforcement. In 2001 Mackie Designs bought Eastern Acoustic Works, the Massachusetts-based loudspeaker company, and in 2001 purchased Sydec, a Belgian software and electronics developer. In September of 2003, Mackie Designs Inc. changed their name to Loud Technologies Inc., in an effort to minimize confusion of the Mackie brand with the parent corporate entity. Matt Redmon of Mackie described integration under the LOUD umbrella as beneficial in a number of ways. For example, shared manufacturing and engineering services provide an economy of scale necessary for achieving a certain price point. Assets such as the Patented Acoustic Correction DSP processing and the custom transducers created by EAW are fully integrated into products like the Mackie HD and SRM Series loudspeakers for optimum product performance, and ultimately for the benefit of the user. Today, Mackie Mixers, Mackie PA Speakers, Mackie Studio Monitors and Mackie Recording products continue to be a commanding presence in the world of speakers, audio production, and engineering. No longer an upstart brand, Mackie continues to innovate and capitalize on their core beliefs of building a product that meets a demand, is satisfying to operate, remains easy to use, provides great value for the price, and maintains the “built like a tank” reliability Mackie is famous for. One perfect example is the Big Knob Series. The original Big Knob was a true problem solver for the project studio that lacked the ability to quickly swap monitoring systems and/or listening sources, all while controlling the volume from a single knob. The humble Big Knob is now a must-have device for many a modern studio. The latest versions include a talkback module for communicating from the control room to the sound room, as well as the latest USB and other I/O control connections. In many circles, the Modular Digital Recorder has given way to the computer Digital Audio Workstation, or DAW system. Mackie has pioneered the efforts to answer those changing demands by equipping many of their audio mixers – such as the ProFXv2 Series – with a built in USB computer audio interface. The mixer now doubles as the digital audio converter, and provides a direct two-channel, two-way connection to the computer via a single USB cable. The proprietary Mackie Onyx and Vita preamps provide a clean input from nearly any source. In addition to large-format boards, Mackie continues to offer full-featured and space-saving compact and ultra-compact mixers. The fact is, Mackie mixers remain both an industry standard and one of the leading in-demand brands for live sound, corporate and commercial audio, schools, houses of worship, audio and video post-production houses, mobile DJs, electronic music producers, the ubiquitous project studio, and nearly any venue where people gather to listen to music and have a good time. Few products from outside the audio world have had such a profound effect as the omnipresent iPad®, and for good reason. The iPad contains tremendous processing power, and perhaps one of the most alluring and intuitive control surfaces ever. Products like the Mackie DL Series provide the hardware jack panels, power supply, DSP Processing, high-grade Cirrus Logic® convertors, and more. The chassis holds a secure place to mount the iPad; removing the iPad allows the freedom to control the mix remotely – from the stage, the sound booth, or out on the dance floor. For less demanding applications, Mackie offers the compact ProDX models for iOS and Android devices. Stepping up in the other direction is the modular DL32R rack-mount wireless mixer chassis. The Mackie Master Fader App delivers total wireless control of the mixer, the EQ, the effects, and so much more. Matt Redmon offered more on the thinking that gave rise to these products, “Whether in the studio or on the stage, it is almost a foregone conclusion that touchscreen and/or other computing devices are part of the setup, and our aim is ever to solve the needs – or improve the experience of – the modern user … and that tends to mean continued expansion into technologies like wireless streaming, mixing, and signal processing that place control at the user’s fingertips. As more and more studios filled with Mackie mixers, Mackie felt compelled to create their own line of active studio monitors, to make sure those mixers were sounding their best. Mackie introduced their first studio monitors – the HR824 – in 1996, and has been making a full line of studio monitors ever since. The CR Creative Reference Series offer outstanding multimedia and music performance, and come complete with all the accessories needed to be up and running. As Matt Redmon explains “in the studio monitoring category, our entry level consumer may not even be the typical MI user on a budget. Instead, this may be the computer user upgrading their speakers from an accessory brand to their first set of real audio monitors. We need to provide that customer with all benefits and professional equity that comes with that purchase.” Select CR models including Bluetooth streaming abilities. HR models include the exclusive Mackie Zero Edge Baffle™ for smooth projection that minimizes audio interference, as well as passive radiator to improve bass response. For a more substantial sound, the XR Series include resilient Kevlar® woofers and provide room optimization controls plus a Logarithmic waveguide design that improves separation and response. Put it all together with one of the Mackie Big Knob models to achieve the ultimate in audio reproduction control. Through experimentation, a proven track record, and acquisitions, Mackie and Loud Technologies amassed a treasure trove of expertise in transducer design, audio processing, powerful and lightweight Class D amplification, cabinet construction – everything needed for successful live sound reinforcement products. The SRM450 was the first powered loudspeaker with the Mackie name, back in 1997. Now, more than ever, Mackie remains committed to delivering the finest in hassle-free sound available, either on the road or installed in a venue. American Musical Supply is honored to carry a great assortment of Mackie powered (and unpowered!) loudspeakers. Matt Redmon of Mackie loves the relationship between Mackie and AMS, “We share the same target customer, and we know we make a great product, but AMS can do the things that we can’t do to earn the customer. For example, AMS puts together pre-configured systems for the customer’s convenience, AMS can offer financing, different delivery options, even extended warranties in a way that the manufacturer simply cannot.” Mackie Live Sound speakers may offer integrated mixing, DSP signal processing, EQ controls, selectable application modes, and the famed Feedback Destroyer. Precision crossovers and time-align circuits improve the sound with extended clarity and coverage. Wood or molded plastic cabinetry provides strength and durability. The appropriate stand mounts, pole receivers, and rigging points for each model are built right in. The Mackie affection for the working musician is evident in the portable, self-contained PA systems available from AMS. The FreePlay Personal PA system offers built-in mixing, onboard effects, and can even run on batteries. Unlock new levels of intuitive control from an iPad or Android device using the FreePlay Connect App – and enjoy Bluetooth streaming. For the street performer to the corporate speaker, from the acoustic musician to the impromptu poetry slam, from the yoga class to herding Cub Scouts, the FreePlay may be the answer. The single-unit Mackie Reach uses exclusive ARC (amplified Radial Curve) array technology and an angled waveguide system to deliver incredibly broad coverage from a single column. 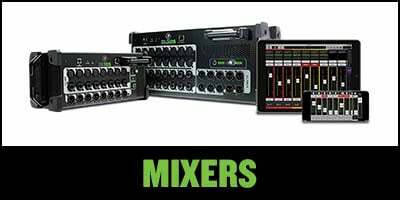 The Mackie Connect App delivers iPad and Android control; the Mackie Earshot offers improved personal monitoring, and the Reach even offers Bluetooth streaming. The onboard mixer features a variety of inputs, four-channel mixing, EQ, DSP, on-board effects, and the famed Mackie Feedback Destroyer. Selectable speaker modes tailor the response for the task at hand. The system is fully expandable with an additional Reach unit.